A snowmobile trail is a groomed and excellent track. In most cases, the joints are also excellent with high bars with a red cross on and instructions for snowmobile driving. These are deployed at intervals of 100-200 meters. • Skiers, dog sledges and pedestrians ALWAYS have preference in the track. The winter trails are marked with guiding stars – cross on poles. When it is allowed to ride a scooter there is a recurring scooter symbol on the pillar posts. The guide posts are located at a distance of 40 meters and the cross is approximately 150 centimeters from the ground. 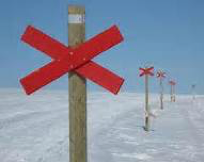 When the cross snows over in frequent areas, they are sometimes extended with a road stick.